What is yoga, and how is it related to Nepal? Since ancient times, the dramatic, breathtaking landscapes of Nepal have been considered deeply sacred. Sages and saints have wandered the Himalayas, immersed in their spiritual practices, and the Lord Buddha was born in the famous gardens of Lumbini (a UNESCO World Heritage site and a place of pilgrimage). Yoga originated an estimated 5000 years ago, and although it is interwoven with Hinduism and Buddhism, it is not a religion, but a philosophy. The earliest testament to Yoga are Patanjali’s Yoga Sutras, a collection of 195 statements that serve as a philosophical guidebook, and a framework for spiritual growth and mastery over the physical and mental body. The Yoga Sutras outline the eight limbs of yoga: the yamas (restraints), niyamas (observances), asana (postures), pranayama (breathing), pratyahara (withdrawal of senses), dharana (concentration), dhyani (meditation), and samadhi (absorption). In a nutshell, exploring these eight limbs leads us to refine our behaviour in the outer world, after which our focus turns inward until we reach samadhi (liberation, enlightenment). Yoga is a powerful tool for self-transformation. It asks us to bring our attention to our breath, thus helping us to still the fluctuations of the mind and be more present in the unfolding of each moment. Today, yoga has spread around the world. It has become widely commercialised, often diluted to mere physical exercise. Our founder, Karnesh Rajthala, has studied yoga in various forms and traditions: He holds a yoga and naturopathy diploma from Sanskrit University in Kathmandu, is a Registered Yoga Teacher (RYT) with Yoga Alliance, and has studied with internationally renowned teachers such as David Garrigues. He has also spent time in ashrams, and met with a number of gurus and sages, who initiated him into sacred disciplines such as Kriya Yoga and Kundalini Yoga. The authenticity of the yoga we teach at Kamala Yoga Nepal is important to him. Why practice yoga with Kamala Yoga Nepal? 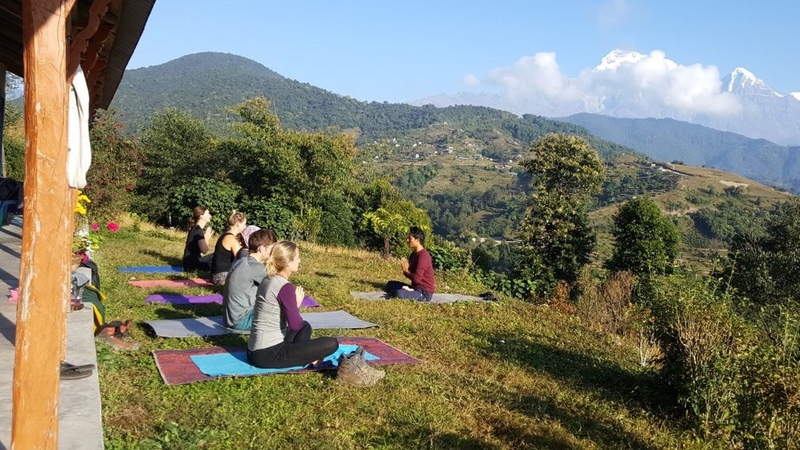 By practicing with Kamala Yoga Nepal, you connect to the original meaning of yoga, in one of the holiest places on earth. Our practice is firmly grounded in the timeless, universal, and sacred philosophy and principles of yoga. Our yoga is accessible: we offer clear and simple guidance for practitioners at all levels. All classes are offered by qualified yoga teachers — individuals who have been immersed in this philosophy since childhood days. It was a greaaat experience, I had a great time! It was very nice to meet you and I hope to see you again, this time in Nepal haha :) Namaste! I highly recommend this company if you are visiting Nepal.